Hana Kassahun Bililign is one of the most important people we work with in Ethiopia. Her job is not the most romantic, and her view is not the most scenic, but as Store Manager for Moplaco, one of our long-term partners in Ethiopia, her task is crucial. She cares for the coffee while it rests. In addition to dealing with logistics and exporting, Hana is responsible for selecting and preserving the highest quality possible. She spends most of her day in a warehouse in Addis Abeba, where Moplaco’s parchment coffee is rested. After the coffee is hulled, it is stored in GrainPro bags until Hana’s team of expert women assesses each coffee bean and discards all but the perfect specimens. Women pickers in the Moplaco warehouse removing any defective beans from the hulled coffee. This resting period in Moplaco’s warehouse, which is insulated to keep temperatures between 19 and 24 degrees celsius, is a crucial step in developing the complex fruit and floral notes so carefully cultivated by Ethiopian coffee growers. Hana cups daily to track the coffee through this important process, and decides the exact moment when it has reached its full potential. Uniquely, Ethiopian coffees often achieve their fullest flavour after three to four months of resting, and keep their freshness for over a year. Some are even better after a year. We have several Ethiopian lots in stock and ready to ship from the November 2016-January 2017 harvest which our team cupped last week. The quality was impressive! All our Ethiopian coffees, including the Kaffa, Kochere, Guji, Wonago and Matahara from Moplaco, are clean and bright and displaying the organoleptic richness that Ethiopian farmers, and coffee professionals like Hana, take great pride in delivering. 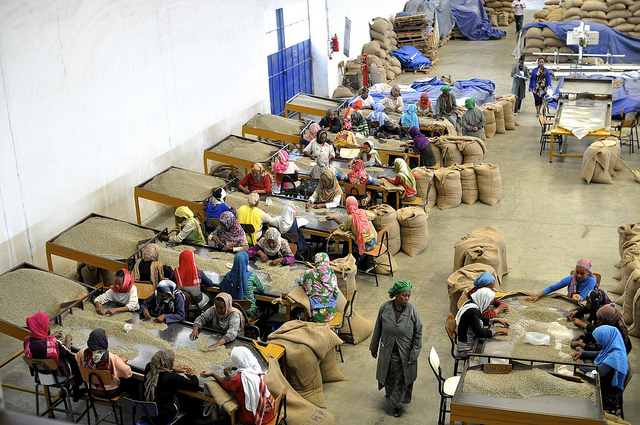 We have some spectacular Ethiopian coffees we need to clear from our Antwerp warehouse. See the full Antwerp Clearance Price List for details and contact Nico to order samples.